It’s a fact – having a great smile is no longer the sole preserve of stars of the stage and screen. And, while a big admirer of the smiles of the rich and famous – Cheryl Cole and Emma Watson among them – Cfast patient Georgina Brett’s newly aligned smile is testimony to the fact that we can all embrace the brace to enhance the way we look. Georgina may work behind the scenes in the broadcasting industry as a TV production co-ordinator, but that didn’t stop her desire to seek a dazzling, red carpet-ready smile. 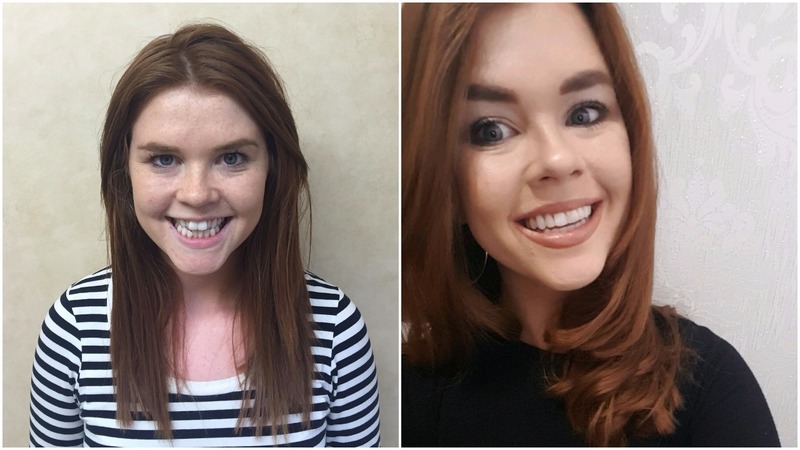 Impressed that the Cfast – Cosmetically Focused Adult Straight Teeth – system promised speedy results in record time, Georgina was determined to fix the wonky smile that often kept her out of the way of any lens. Her treating dentist was Dr Tom Owen, co-owner of Wish Dental in Poynton in Stockport, who has treated many patients using Cfast. For Georgina, he chose the Cfast labial option that uses aesthetically pleasing clear brackets and tooth-coloured nickel-titanium wires that are placed on the front surface of the teeth. And, although she shared the secret of her treatment with some of her nearest and dearest, many others close to her failed to realise she was wearing the braces throughout treatment. There were a few foods she struggled to eat while she underwent treatment but that suited Georgina. Cleaning teeth can also be a challenge for some brace wearers and Georgina thoroughly recommends interdental cleaning to reach the awkward crevices that are created between the brackets and wires and the teeth. Maintaining good oral health is vital during this period and you don’t want to ruin a newly straightened smile with tooth decay. Dentists often recommended you use a floss threader in order to make flossing easier. Now the treatment is over, Georgina couldn’t be happier and is delighted with the result, which has it boosted her confidence? – ‘Definitely! I'm so glad I did it,’ she says. In fact, there are three options for those of us seeking to straighten our teeth using Cfast. SmileTRU is a series of removable clear aligners for those patients who cannot – or choose not to – wear a fixed appliance. Each positioner is designed to fit over the teeth and apply gentle forces to gradually move the teeth. Each aligner is worn for 22 hours a day for two weeks. After this time, you can then move onto the next positioner. This step-by-step approach ensures gentle forces are only applied to the teeth, minimising any discomfort. Simple lingual braces are customised to your mouth, which helps make them efficient, effective and less intrusive. They use brackets positioned on the inside of the mouth to gently move and align the front four to six teeth. They are totally inconspicuous and your teeth can be straightened without worrying about your appearance.